Get out of town with these interesting Perth side-trips: Mandurah (Dolphin & Whale Watching, Dolphin Quay, & more), Rockingham (Penguin Island, Point Peron, & more) and Warnbro Beach (in Warnbro). Pack the 25th (Fri) with family-friendly diversions at Adventure World Perth Australia. Dedicate the 26th (Sat) to wine at some of the top wineries in the area. 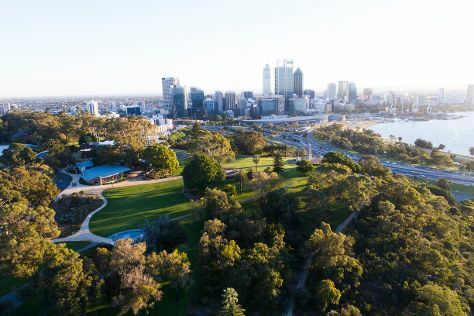 And it doesn't end there: take in nature's colorful creations at Kings Park & Botanic Garden, identify plant and animal life at Caversham Wildlife Park, pause for some photo ops at Kings Park War Memorial, and contemplate the long history of The Perth Mint. To find photos, reviews, where to stay, and more tourist information, use the Perth trip planner . If you are flying in from Ireland, the closest major airport is Perth International Airport. In January in Perth, expect temperatures between 38°C during the day and 20°C at night. Wrap up your sightseeing on the 10th (Sun) to allow time to travel back home.